Los Pelambres mine. Photo from Los Pelambres' website. An 18-pages long report released today by the London Mining Network slams Antofagasta Minerals’ 60%-owned Los Pelambres copper mine, located in the central-northern of Chile in Coquimbo Region. In a move that comes just a couple of days prior to Antofagasta’s (LON:ANTO) annual general meeting in London, the document titled In the Valley of the Shadow of Death? 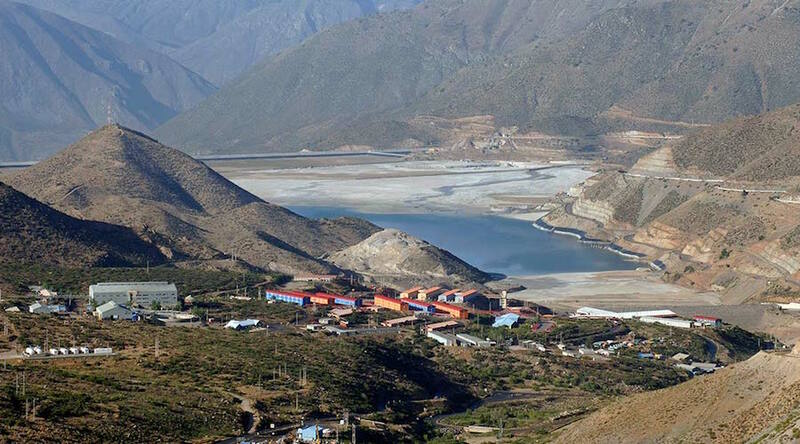 A Report on Antofagasta Plc, Minera Los Pelambres and Los Caimanes, highlights allegations of corruption, environmental damage and water depletion caused by the project’s waste tailings dam. According to the report, the El Mauro tailings dam, with a capacity of 1,700 million tonnes of mine waste, is the biggest in Latin America, surpassing Brazilian Samarco dam by 100 times. The magnitude of the dam, the dossier reads, is a cause of concern for both environmental groups and local residents, who think a similar the disaster to that that took place at Samarco in 2015 could happen in their own community. In response, a company's spokesperson told MINING.com that Los Pelambres does not use water from the Pupio Valley basin, where both Caimanes and the El Mauro dam are located. She also noted that El Mauro is not Latin America's biggest dam and the 1,700 million-tonnes figure corresponds to the dam's total capacity, which will be reached at the end of its life. Samarco’s breach was linked to small earthquakes and El Mauro’s facility not only is located in a highly seismic region, but it is also expected to grow in size as part of the Los Pelambres’ plans to expand production. “People living in the village of Caimanes would be expected to evacuate their homes within ten minutes of a breach at Antofagasta’s El Mauro dam,” the report states. The company, however, says this is yet another of the inaccuracies contained in London Mining Network's report. As outlined in a document submitted to the competent authorities, Antofagasta told MINING.com that an eventual collapse of the dam would — in the worst case — give people at least 24 minutes to evacuate the town. By then, the tailings will reach the village, but "they won't sweep it and would only affect a small low area," the spokesperson noted. "El Mauro is operated with the highest possible safety standards in the mining industry and, as dictated by Chilean regulation on tailings dams, is being permanently controlled, " Antofagasta said in the e-mail statement. "In fact, the dam didn’t have any problems following a September 2015 earthquake, which measured 8.3° on the Richter scale, and following which, the neighbours of Caimanes inspected the dam to certify its integrity." While Los Pelambres has published a government-approved emergency plan, “residents’ attempts to access this plan using the Transparency Law have not been attended to,” today’s report adds. Community concerns have resulted in a series of actions that date back to 2006 and that have delayed the company’s idea of building two new grinding mills and a desalination plant. One of the major actions against the El Mauro tailings dam took place in July of 2013 when the Chilean Supreme Court ruled the tailings dam a “danger to human life” and made Minera Los Pelambres officially liable for any loss of human life in the event of a collapse of the dam. El Mauro dam. Photo from Los Pelambres' website. Such ruling highlighted that the dam is constructed to withstand an earthquake of between 7.5 and 8.3 magnitude with an epicentre 80 km away, when the actual closest epicentre is just 60 km away. Thus, the company was ordered to submit the aforementioned emergency plan to reinforce the dam in case of an earthquake. Later on, in May of 2014, Los Caimanes residents won a case against Minera Los Pelambres in the court of Los Vilos Province. The tailings dam was ruled a “Ruinous Work” (Obra Ruinosa – which asks for the demolition of the facility), in reference to the risk of the dam’s collapse in the event of an earthquake. However, the ruling was appealed in April of 2015, the company presented a safety action plan and a strategy to reduce the dam’s liquid content and, in the end, Los Pelambres won the appeal. In October of that same year, in a case relating to the ongoing construction of the dam wall (“Obra Nueva”), the Chilean Supreme Court ordered Minera Los Pelambres to restore the free flow of uncontaminated water to the Pupio basin, where the tailings dam is located, and to do this by demolishing the tailings dam or by executing other actions that would help solve the situation. The company was permitted one month to present such alternative option. In August of 2016, following an appeal of a prior decision against it by the Supreme Court, Los Pelambres was permitted to leave the dam in place, while improving its safety features and providing access to water in the area through pipes and tanks, rather than restoring the natural water flows. The latter decision came following a May 2016 “Agreement of understanding and cooperation between the mining company and the residents of the Pupio valley,” which lays the groundwork for the expansion of the mine and tailings dam, or possible construction of another tailings dam in the area. This agreement, says London Mining Network’s report quoting researchers and residents, had a lot of influence in the August of 2016 appeal and was led by lawyers that later on withdrew from the case. The document stated that families who signed would receive around £35,000 which, says LMN, wouldn’t sustain them for long. The activist group also says the money wouldn’t guarantee many of them the amount of land, or the standard of living, they had prior to the construction of the tailings dam. When it comes to claims of pollution, the document cites a 2012 independent investigation undertaken by Andrei Tchernitchin from the University of Chile, who found high levels of manganese, mercury, iron, nickel and molybdenum in water sources in the area, caused by permanently occurring leakages into the groundwater channels in the area. The report also quotes a Chile's environmental regulator 2016 charges against Los Pelambres for extracting water from unauthorized sites, building unapproved wells and failing to reforest some areas as required by law. "Those nine charges are related to vegetation and other regulatory issues. None of them put lives or the environment at risk," said the company, adding it has already submitted a plan to comply as soon as possible and that it's currently awaiting for approval from Chile's environmental regulator SMA. Minera Los Pelambres produces levels of around 400,000 tonnes of copper and 8,000 tonnes of molybdenum per year. NOTE: This article has been edited to include the company's comments, sent a day after MINING.com requested comments on the matter.